. استمتع بالخدمات الراقية والضيافة التي لا مثيل لها بهذا الفندق في ملبورن. يمكن لضيوف الفندق الاستمتاع بالميزات التالية على أرض الفندق: واي فاي مجاني في جميع الغرف, خدمة التنظيف يوميًا, خدمة سيارات الأجرة, مجهز لذوي الإحتياجات الخاصة, مرافق مخصصة لذوي الاحتياجات الخاصة . في Kimberley Gardens Hotel & Serviced Apartments غرف نوم يزيد عددها عن 52 صممت بذوق وعناية لتوفر لك كل وسائل الراحة . بعضها يحتوي أضاً على تلفزيون بشاشة مسطحة, حوض الاسترخاء, غرف لغير المدخنين, مكيف هواء, تدفئة. صممت خدمات الاستجمام في الفندق والتي تتضمن حوض استحمام ساخن, مركز للياقة البدنية, حمام سباحة داخلي, سبا, حديقة لمساعدتك على الاسترخاء والراحة. اكتشف مزيجاً ساحراً من الخدمة الاحترافية والخيارات الواسعة من وسائل الراحة والمتعة في Kimberley Gardens Hotel & Serviced Apartments. the hotel was very good for our needs, we wanted to be in the heart of the jewish community, by our children's house. that was the major draw. rooms where relatively large and confortable. not modern nor well stocked with amenities. the staff where very pleasent, and helpful. The position is great if you are wanting to be right in the borscht belt. The staff are friendly and obliging. It’s like staying with family and meeting relatives and friends in the foyer at random. Free off street parking is a bonus. It’s a shame that they removed the snack and soft drink vending machines. Look, for the money it was a good deal. They were in the middle of some renovations. So, some allowances had to be made. The staff were supper friendly. Everything in the room worked and the bathroom was cleaner than a lot of other "more stars" accommodation. It was better room value than more expensive places, in which I have stayed. However, the restaurant is very expensive. I would stay there again under similar room pricing conditions. Clean rooms with great facilities. A small pool and gym available. Value for money. Room was spacious, bathtub with massage was fantastic. Staff was friendly. Need to walk a distance to the nearest food stall. Overall, great stay. The apartments were very good value for money, very close to our night out in St Kilda. The rooms are very neat and tidy and the staff were excellent and courteous. The complex isn't as good as the pictures showed, it is starting to get a little outdated but the price was excellent for a 1 night stay. The hotel manager is very rude, tried to charge me for breakfast even though it was included in booking. Tried to get out of refunding me my bond of $200 saying it was not charged to my card. I checked my transaction history and I had been charged. $4 for a bottle of water most hotels give this for free. One of the most rudest hotel Managers I have ever witnessed how dare you try and steal money from guests right in front of there face. Be very careful if you visit this hotel. We had a lovely stay at Kimberley Gardens while in Melbourne. The room was a good size, clean and bed was comfortable. Breakfast was decent but basic with coffee, pastries, bagels, cream cheese and boiled eggs. The location is a bit tricky if you don't have transport but you can hire a car from the front desk and they supply travel cards for Melbourne public transport ($10 deposit which is returned on return of the card). We ended up taking a lot of Ubers as the public transport is not that close to the hotel unfortunately. We really enjoyed the pool and spa. And the staff were really friendly and helpful. 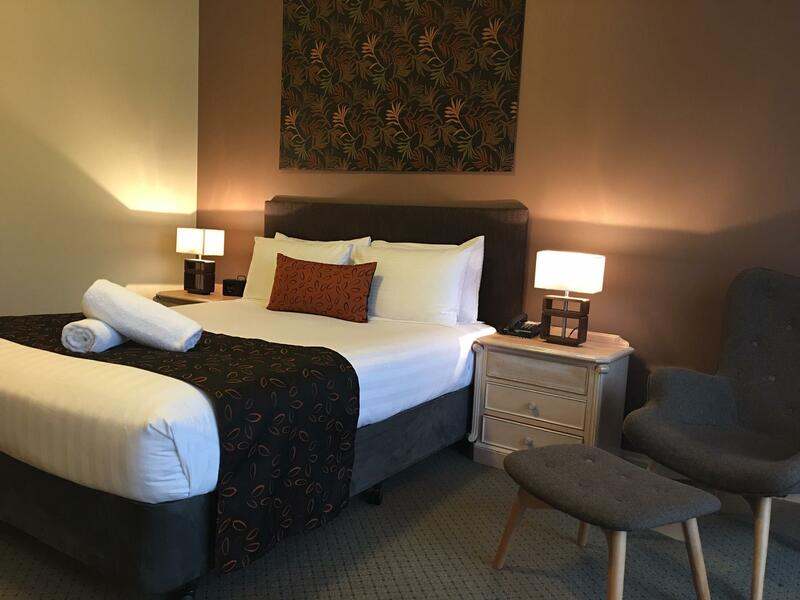 Overall we really recommend Kimberley Gardens for a good St Kilda stay while in Melbourne. Friendly and helpful staff and overall had a really nice stay .Perfect location for what we needed . Has a nice bar and restaurant on premises too which was very fancy . Not knowing the area & proximity to the train station, I chose The Kimberley Gdns by their advert on the internet. It was an excellent choice. Richard on the front desk was very pleasant on arrival, thank you, and the rooms were spotless. We were visiting from England for a days play the Ashes at the MCG, so it was essential we had a relaxing place to stay. The Kimberley fulfilled this request to the full. I would definitely recommend it. We loved it here. What attracted me initially was the free car parking and the reasonable cost. When I got inside I thought the place had a great feel. It is a little worn in places but I wasn't paying for 5 stars. The room we had was clean (the only reason I gave 4 stars was that some of the glasses and dishes hadn't been cleaned properly by the last occupant of the room) and spacious and the staff were very accommodating. I'd be back in a flash. We got a great deal for two night stay. Yes, building is older and the carpet probably needs replacing but all things considered, couldn't care less. Quiet, comfortable bed and not far from inner city and beach. Very happy! Check out at 12 midday was simple to arrange, and appreciated. We ran the heater in our room, room 36, into the night as the weather was extremely cold. The heater was excessively noisy, to the degree that after a late night dining out it woke me up at 6.30 a.m., and kept me awake. I recommend no one enter the spa wearing sterling silver jewellery either. Each and every item I wore, including 2 genuine Tffany items, turned black. Some were brought back to life with silver cleaning cloths, which cost me $19-, however my 2 Tiffany pieces, a bracelet and ring, required professional cleaning at a personal cost of $60-. When I suggested to the manager that placing a sign warning people that their jewellery could be affected, may be a good idea, his attitude was to say the least dismissive..which I did not appreciate. We had a spa bath in our room and it was perfect! Loved their pool and spa area although the roof could do with a clean. The room was nice and roomy and comfortable and the staff were always helpful. They could do with dedicated parking for hotel users as they had a function at the restaurant and all the parking was gone and we had to park quite a way down the road. We stayed 7 days and not once did they top up the milk/tea/coffee. Also you can hear the water running and people in the corridors defiantly need sound proofing especially when someone takes a shower in the middle of the night. The room was lovely tho and well spaced out with a big desk and lovely courtyard. Overall it was a nice place to stay at for a week. My second stay at Kimberly Gardens. I would stay there again for it's peaceful tranquility. Comfortable hotel with welcoming staff.